Heartworms are common in dogs throughout the United States (cats can have them, too). They are among the most damaging parasites in dogs but they are almost 100 percent preventable. 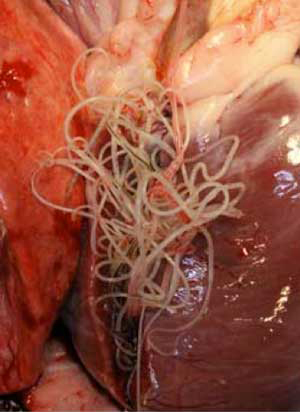 Heartworms are transmitted by mosquitoes and, once mature, they live in the heart and large blood vessels of the lungs. Adult heartworms can measure over one foot in length. View the heartworm disease infection rate forecast for your local area at https://petdiseasealerts.org. How will heartworms affect my dog? The heartworm larvae deposited by the feeding mosquito eventually migrate to the chambers of the heart or into the vessels of the lungs. Once in the heart, the worms can affect blood flow throughout the body. Heartworm infection can affect many different organs of the dog—heart, lungs, kidneys, and liver, for example—so symptoms may be varied. Most commonly though, signs of heart or lung disease are present. A veterinarian may suspect that a dog has been infected if an active animal tires easily or shows shortness of breath or coughing. Early in the disease, dogs are often asymptomatic. Signs are often progressive over weeks to months and untreated, heartworm infection can be fatal. Blood tests are most commonly used to diagnose heartworm infection in dogs. An in-house screening test run by your veterinarian may be followed by a confirmatory blood test sent to an outside lab. Other tests frequently employed in determining the extent and severity of heartwom infection in a dog include blood tests of kidney and liver function, x-rays of the chest and an ultrasound (sonogram) of the heart. Once infection is confirmed, your veterinarian will discuss the most appropriate treatment for your pet. How do I prevent my dog from getting heartworms? Heartworms have been found in dogs in all 50 states so all dogs are at risk, even those animals that primarily live indoors. Fortunately, with medication, heartworm infection is almost always preventable. Ask your veterinarian about heartworm prevention. Preventive treatment should begin at 6 or 8 weeks of age in puppies and after tests have been conducted in older dogs to determine if your dog has already been infected. An annual blood test should be run to confirm the dog continues to be negative for heartworms. If your dog does have heartworms, your veterinarian can advise you about treatment options. Can humans contract heartworm disease? Isolated and rare cases of human infection have been reported, however, the heartworm is generally not considered a risk to human health and direct transmission of heartworm from dogs to humans is not possible. For veterinary professionals, more detailed information on heartworms can be found at https://www.capcvet.org/guidelines/heartworm/. If left untreated, heartworm disease can result in your dog's death. 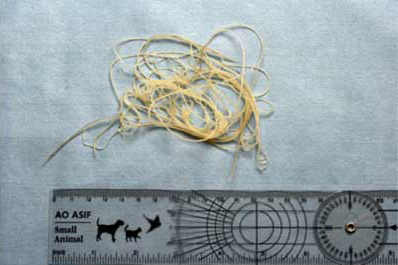 Heartworms can grow to 16 inches in length and there can be as many as 250 heartworms in a dog's vital organs. Your dog can have no symptoms until heartworms are well-established. Almost 300,000 dogs in the U.S. are infected with heartworms each year. It is difficult, especially for your dog, to treat heartworms once established. It is much easier and less expensive to prevent heartworms than to treat them. Other kinds of worms that dogs can get include hookworms, roundworms, tapeworms, and whipworms. Preventive treatment should begin at 6 or 8 weeks of age in puppies and after tests have been conducted in older dogs to determine if your dog has already been infected. If your dog does have heartworms, your veterinarian can advise you about treatment options.